Every year on 12 April, space enthusiasts the world over mark the first manned space flight by celebrating Yuri's Night. This year has special significance, as the 50th anniversary of that milestone (and also the 30th anniversary of the first US space shuttle flight). Join Londonist Editor (and space fanatic) M@ Brown and stand-up comedian Helen Keen for what might just be the world's first ever fancy-dress variety show themed around outer space: Spacetacular! We're lining up a mixture of comedians and space scientists for a rapid-fire evening of interplanetary enthusiasm. You can also expect a space quiz (with prizes). Best of all, the evening will finish with an audience 'show and tell'. 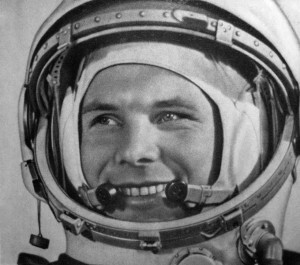 Bring in any space memorabilia or toys, or share your space anecdotes with the rest of the pub. Perhaps you watched a shuttle launch. Maybe you've met an astronaut. Maybe you are an astronaut. Fancy dress — from a hint of tin foil to a full-on spacesuit — is encouraged, but not obligatory. The event takes place upstairs at the Camden Head pub from 8pm (doors open at 7.30pm). Entrance is £3. If you'd like to come, please say you're coming on the Facebook page, to help keep a handle on numbers. Other Yuri's Night parties are taking place across the region. And you can check out Helen's latest show, It Is Rocket Science, on Radio 4 right now via iPlayer.